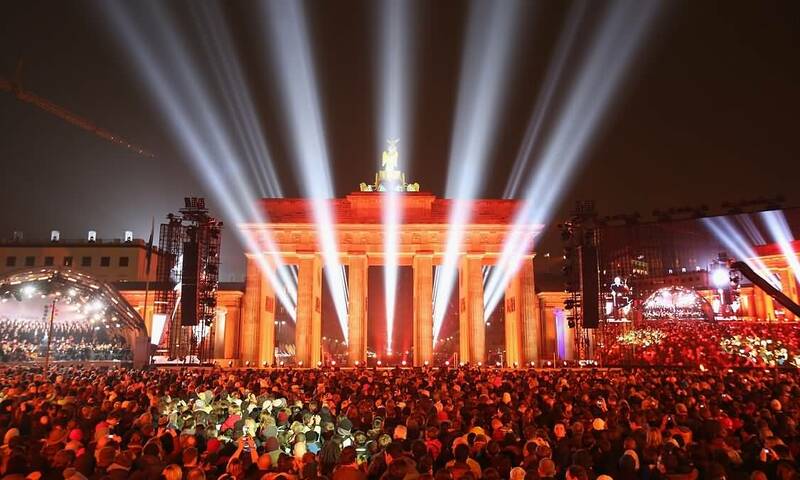 Today is the Day of German Unity (Tag der Deutschen Einheit) commemorating the anniversary of German reunification in 1990 when the goal of a united Germany, that originated in the middle of the 19th century, was fulfilled again. The name addresses neither the re-union nor the union, but the unity of Germany. 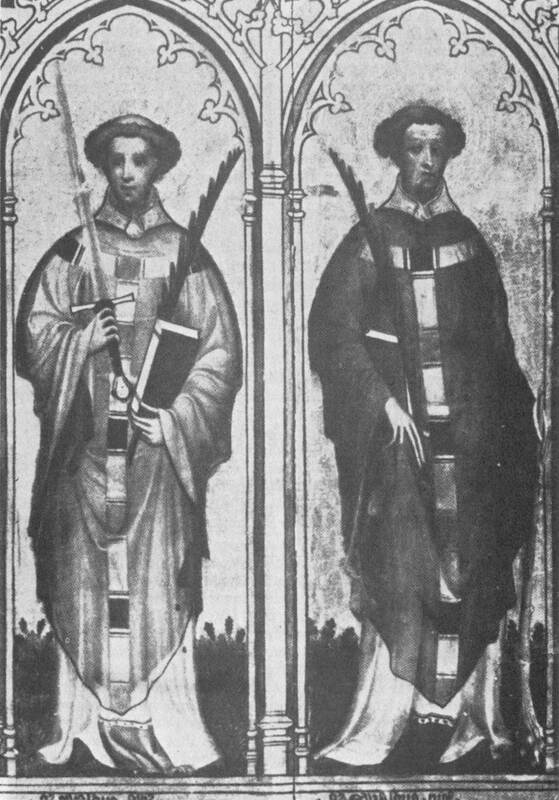 Today is a two-fer, however, because it is also the saints’ day of the two Ewalds, Ewald the Black and Ewald the Fair, who were reportedly martyred on this date in Old Saxony, now Westphalia, in 692. The Day of German Unity on 3 October has been the German national holiday since 1990, when the reunification was formally completed. An alternative choice to commemorate the reunification could have been the day the Berlin Wall came down, 9th November 1989, which coincided with the anniversary of the proclamation of the German Republic in 1918, and the defeat of Hitler’s first coup in 1923. 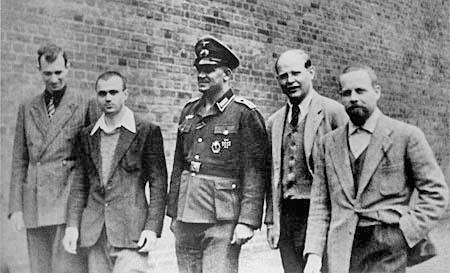 However, 9th November was also the anniversary of Kristallnacht, the first large-scale Nazi-led pogrom against Jews in 1938, so the day was considered inappropriate as a national holiday. 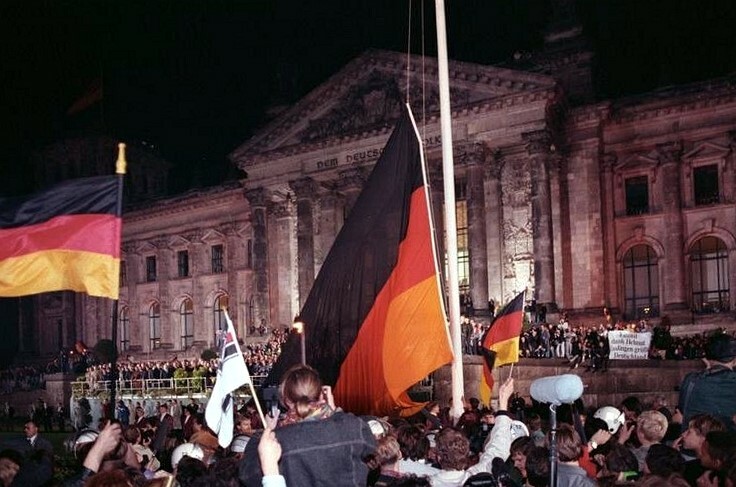 Therefore, 3rd October 1990, the day of the formal reunification, was chosen instead and replaced the “Day of German Unity” on 17th June, the national holiday of the Federal Republic of Germany from 1954. The Day of German Unity is celebrated each year with a ceremonial act and a citizens’ festival (Bürgerfest), hosted by a different major city each year, usually the state capital, in the German state presiding over the Bundesrat in the respective year (a sequence determined by the Königstein Agreement). After Bonn in 2011, Frankfurt am Main was the second non-state capital to host the celebrations in 2015; however, both cities bear a significance for German history (Bonn as former capital of West Germany and Frankfurt Parliament of 1848/49). 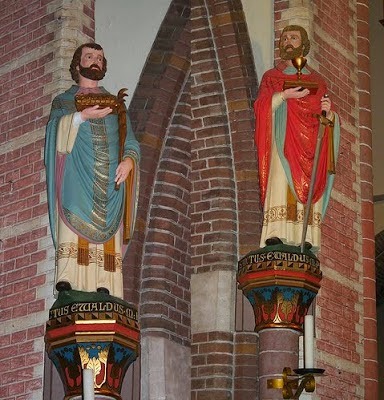 The Two Ewalds, Saint Ewald the Black and Saint Ewald the Fair, were companion missionaries with the same name, and distinguished by the color of their hair. They both priests, and both natives of Northumbria in England, but of Saxon heritage. 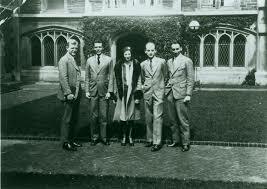 As was common at the time, they spent several years as students in schools in Ireland. Ewald the Black was the more learned of the two, but both were equally renowned for their holiness. 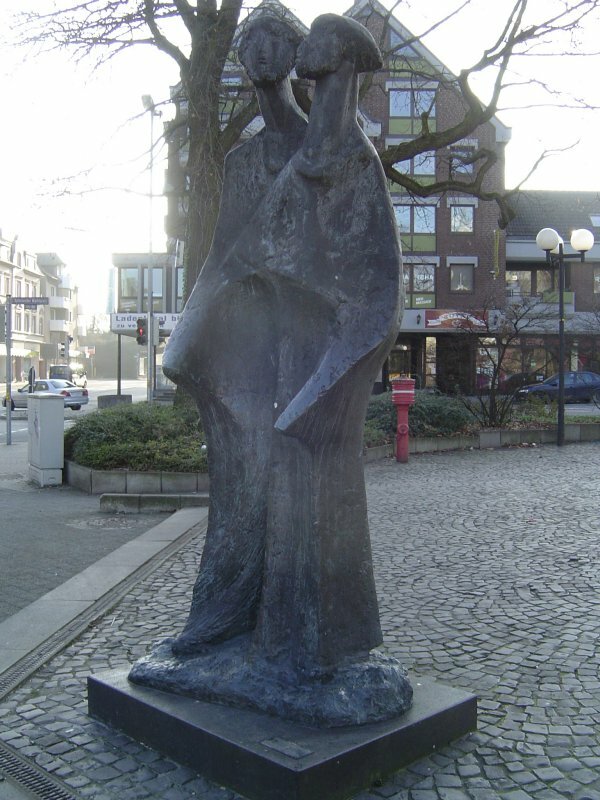 They were apparently acquainted with St. Willibrord, the Apostle of Friesland, and were inspired by his zeal for the conversion of Germanic peoples. Some sources number them among the eleven companions of that saint. More probably, however, they set out from England after St. Willibrord’s departure, in an attempt to convert their own compatriots in Old Saxony. 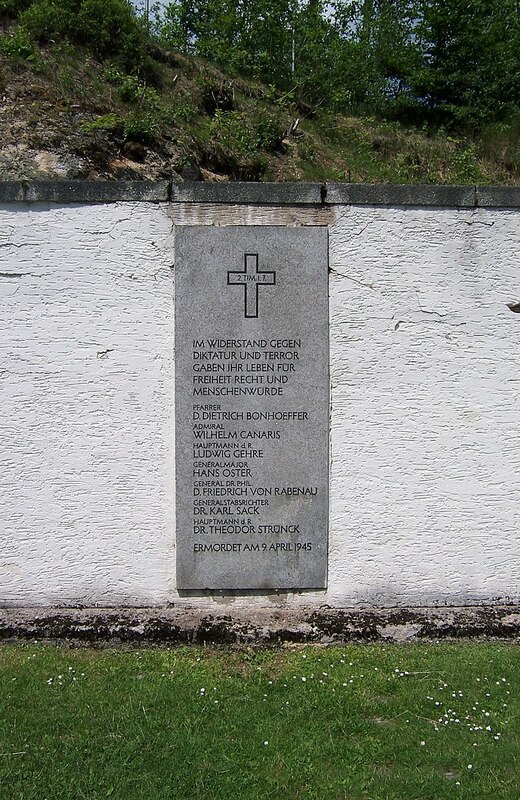 They entered upon their mission about 690 in an area covered by the dioceses of Münster, Osnabrück, and Paderborn. At first the Ewalds took up lodgings in the house of the steward of a Saxon earl or ealdorman (satrapa). Bede remarks that “the old Saxons have no king, but they are governed by several satrapas who during war cast lots for leadership, but who in time of peace are equal in power.” The steward entertained his two guests for several days, and promised to conduct them to the chieftain, whom they intended to Christianity. Local Saxons, witnessing these activities, suspected that the Ewalds intended to destroy their temples and supplant their religion, and decided to kill them. An uprising followed and both priests were seized. Ewald the Fair was killed quickly by sword; Ewald the Black was tortured and torn limb from limb, after which both their bodies were cast into the Rhine. This is understood to have happened on 3rd October at a place called Aplerbeck, today a district of Dortmund, where a chapel still stands. When the ealdorman heard of what had been done, he became angry and fearful of reprisals, and punished the murderers by putting them to death and burning their villages. Christian sources describe various miracles after the priests’ deaths, including their martyred bodies being miraculously carried against the stream for the space of forty miles to the place where their companions were residing. “As they floated along,” says the Catholic Encyclopedia, “a heavenly light, like a column of fire, was seen to shine above them.” Even the murderers are said to have witnessed the miraculous brightness. Moreover, one of the martyrs appeared in a vision to the monk Tilmon (a companion of the Ewalds), and told him where the bodies would be found: “that the spot would be there where he should see a pillar of light reaching from earth to heaven”. 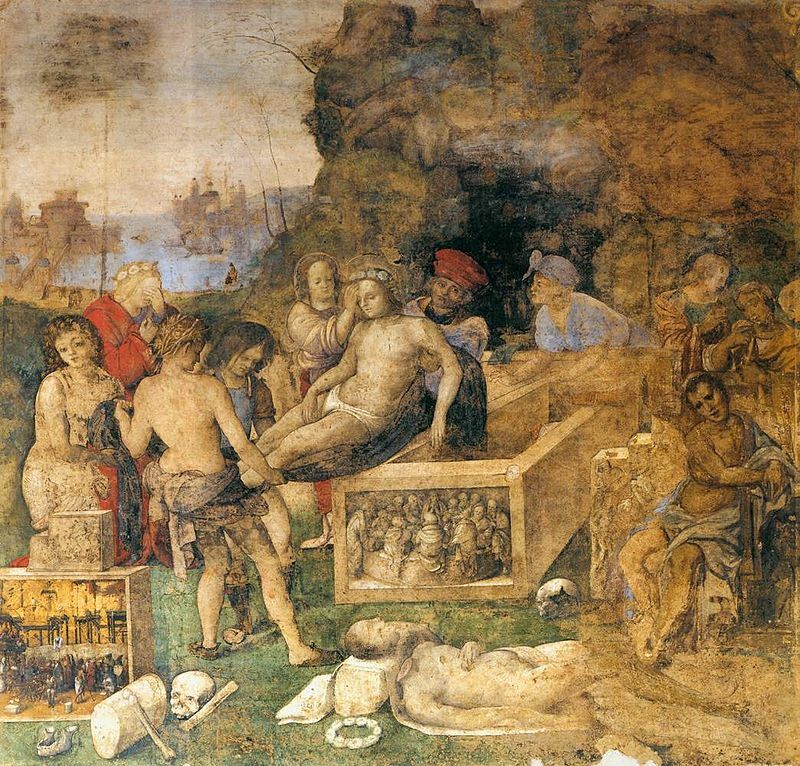 Tilmon arose and found the bodies, and interred them with the honors due to martyrs. 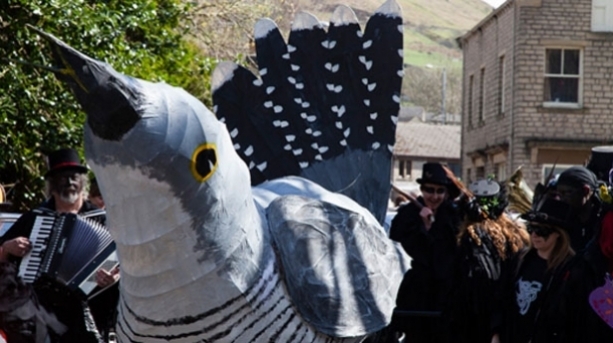 From that time onwards, the memory of the Ewalds was annually celebrated in those parts. A spring of water is said to have gushed forth in the place of the martyrdom. The Saxons were eventually converted to Christianity by force in the 8th century by Charlemagne. The two Ewalds are honored as patrons in Westphalia. Their feast is celebrated in the dioceses of Cologne and Münster. Westfälisches Blindhuhn is a well known Westphalian soup. It literally means “Westphalian blind fowl” but is actually a bean soup with bacon and fruit. 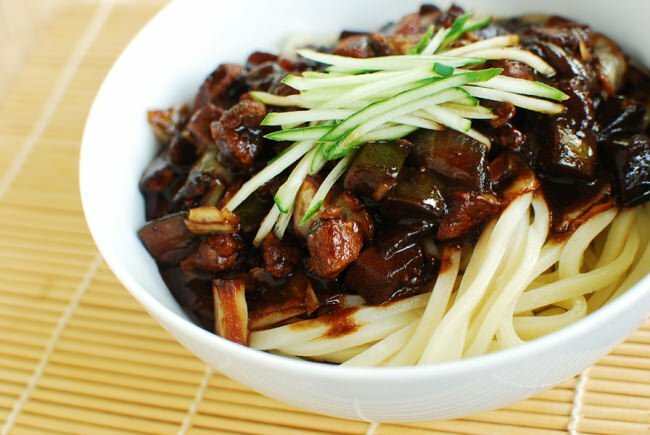 Recipes vary greatly from cook to cook, but this one is reasonably standard. Place the beans in a large pot, cover with 1 quart of water, bring to a boil and cook, uncovered for 2 minutes. Turn off the heat and let the beans soak for one hour. Drain the beans and discard the soaking water. Add a fresh quart of water, add the bacon, and bring to a simmer Cover the pot and simmer very slowly for at least an hour or until the beans are just tender. Add the apples, pears, green beans, carrots, and potatoes to the pot. Season with pepper to taste, and additional salt if needed. Partially cover the pan and simmer, stirring occasionally, for 30 minutes longer, or until the vegetables and fruit are tender and the beans fully cooked. Serve hot in deep bowls with sliced pumpernickel. 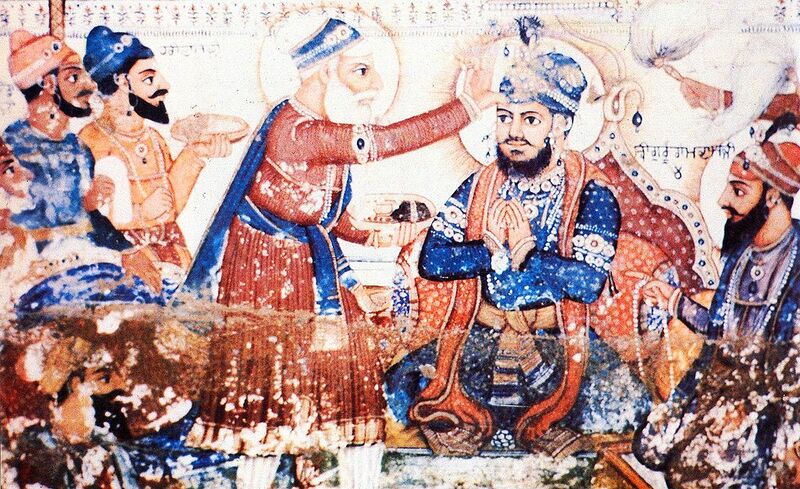 On this date, devout Sikhs honor the martyrdom of Guru Arjan, fifth of the ten Sikh gurus. His actual date of death is not known, but this is the conventional date of memorial in the Sikh calendar. It’s not a big festival day, but it is an important memorial because of the importance of Guru Arjan in the development of Sikhism, particularly as a martyr. His death spawned the militant branch of Sikhism that has persisted for centuries, spurring endless violence between Sikhs and Muslims, as well as with other sects. Let me state this emphatically at the outset. 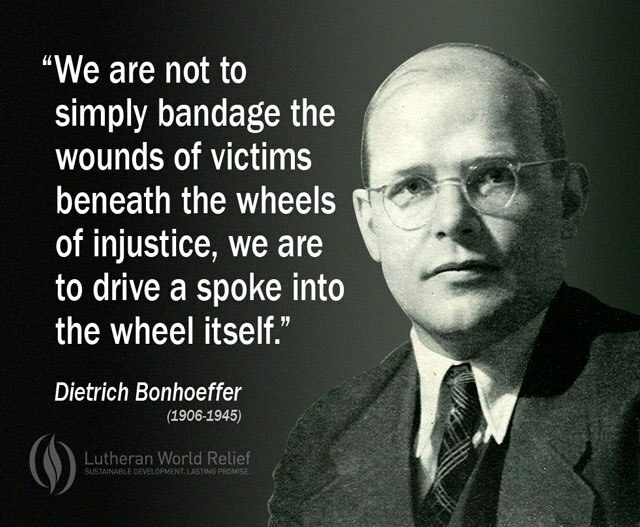 Violence in the name of religion is wrong – period. Sikhism, Judaism, Islam, Christianity, you name it, are all religions that are fundamentally opposed to violence, yet numerous followers use their “faith” to conduct holy wars or acts of terrorism. This is just plain wrong, and is nothing more than using religion as a cover for their own brands of bigotry and hatred. Guru Arjan (sometimes spelled Arjun) was born in Goindval, Punjab, the youngest son of Guru Ram Das and Mata Bhani, the daughter of Guru Amar Das. 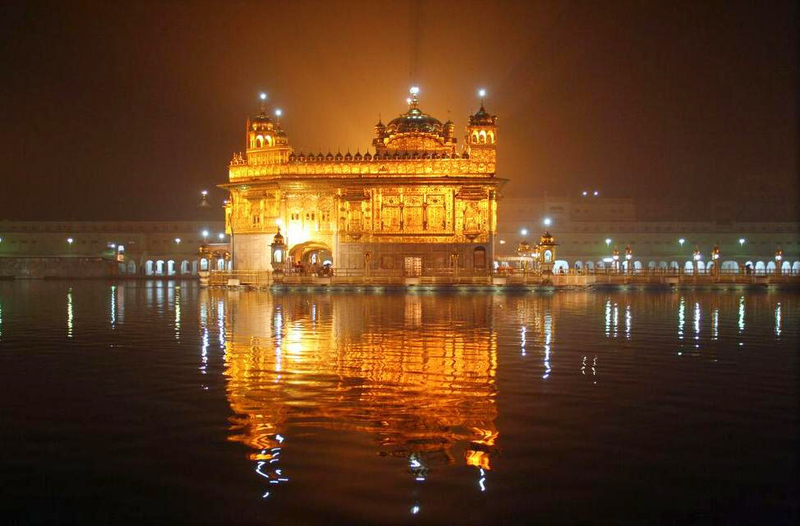 Guru Arjan was the Guru of Sikhism for a quarter of a century. He completed the construction of Amritsar and founded other cities, such as Taran Taran and Kartarpur. 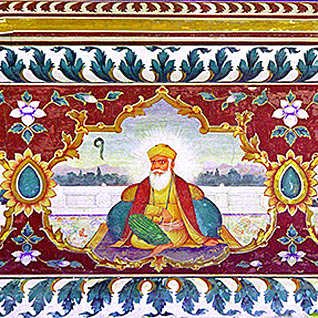 The greatest contribution Guru Arjan made to the Sikh faith was to compile all of the past Gurus’ writings, along with selected writings of other saints from different backgrounds which he considered consistent with the teachings of Sikhism into one book, now the holy scripture: the Guru Granth Sahib. It is, perhaps, the only Sikh scripture which still exists in the form first published (a hand-written manuscript) by the Guru. Guru Arjan introduced the Masands, a group of representatives who taught and spread the teachings of the Gurus and received the Dasvand, a voluntary offering of a Sikh’s income in money, goods or service. Sikhs paid the Dasvand to support the building of gurdwaras and langars (shared communal kitchens). Although the introduction of the langar was started by Guru Nanak, Guru Arjan is credited with laying the foundation of the systematic institution of langars as a religious duty, one that has continued ever since. 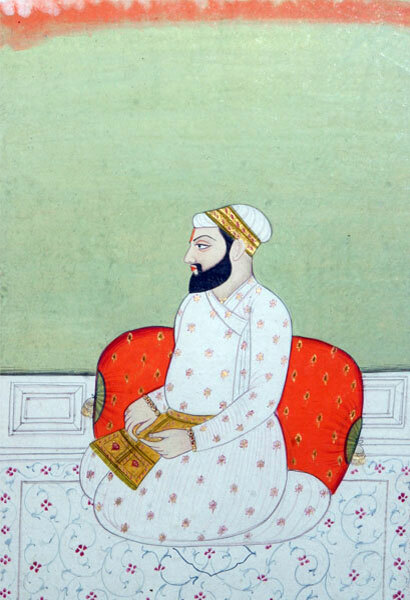 Guru Arjan was arrested under the orders of the Mughal Emperor Jahangir and ordered to convert to Islam. He refused, was tortured and executed in 1606 CE. 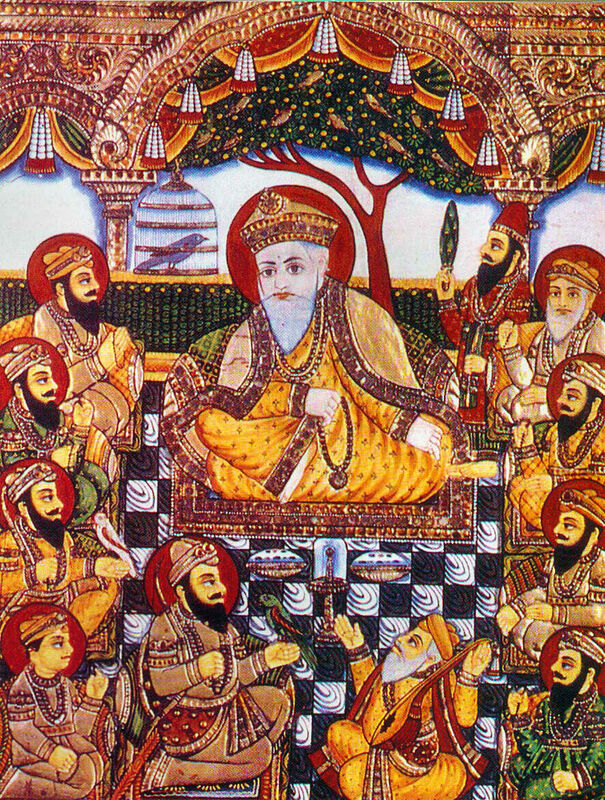 Historical records and the Sikh tradition are unclear whether Guru Arjan was executed by drowning or died during torture. His martyrdom is considered a watershed event in the history of Sikhism. Sikhism is not especially well understood in the West although it is easy to spot a Sikh male by his beard and turban. Sikhism ( ਸਿੱਖੀ Sikkhi), is a monotheistic religion that originated in the Punjab region of South Asia during the 15th century. The fundamental beliefs of Sikhism, articulated in the Guru Granth Sahib, include faith and meditation on the name of the one creator, unity and equality of all humankind, engaging in selfless service, striving for social justice for the benefit and prosperity of all, and honest conduct and livelihood while living a householder’s life (marriage is an important obligation). Although one of the youngest amongst the major world religions, with over 25 million adherents worldwide, Sikhism is the fifth-largest religion in the world. Sikhism is based on the spiritual teachings of Guru Nanak, the first Guru, and the ten successive Sikh gurus. After the death of the tenth Sikh Guru, Guru Gobind Singh, the Sikh scripture, Guru Granth Sahib, became the general spiritual guide for Sikhs. Sikhism emphasizes simran (meditation on the words of the Guru Granth Sahib), that can be expressed musically through kirtan or internally through Nam Japo as a means to feel God’s presence, and to have control over the “Five Thieves” (lust, rage, greed, attachment and conceit). Secular life is considered to be intertwined with the spiritual life. Guru Nanak taught that living an “active, creative, and practical life” of “truthfulness, fidelity, self-control and purity” is above metaphysical truth, and that the ideal disciple (i.e. sikh) is one who “establishes union with God, knows the Will of God, and carries out that Will.” Sikhs established the system of the langar, or communal kitchen, in order to demonstrate the need to share and have equality between all people. Guru Hargobind, the sixth Sikh Guru, established that the political/temporal (Miri) and the spiritual (Piri) realms should be mutually coexistent. Sikhs also reject claims that any particular religious tradition has a monopoly on Absolute Truth. The development of Sikhism was influenced by the Bhakti movement, which developed out of the Vedic tradition of Hinduism. However, Sikhism was not simply an extension of the Bhakti movement, but a radical change in direction – rejecting polytheism, for example. Sikhism developed while the Punjab region was being ruled by the Mughal Empire. Both Guru Arjan and Guru Tegh Bahadur, after they refused to convert to Islam, were tortured and executed by the Mughal rulers. The Islamic era persecution of Sikhs triggered the founding of the Khalsa, as a militant order to defend freedom of conscience and religion. A Sikh is expected to embody the qualities of a “Sant-Sipāhī” – a saint-soldier. God in Sikhism is known as Ik Onkar, the One Supreme Reality. or the all-pervading spirit (which is taken to mean God). This spirit has no gender in Sikhism, though translations may present it as masculine. It is also Akaal Purkh (beyond time and space) and Nirankar (without form). In addition, Guru Nanak wrote that there are many worlds on which Ik Onkar has created life. Guru Nanak further states that the understanding of Akaal is beyond human beings, but at the same time not wholly unknowable. Akaal is omnipresent (sarav viāpak) in all creation and visible everywhere to the spiritually awakened. Guru Nanak stressed that Ik Onkar must be seen with “the inward eye”, or the “heart”, of a human being: devotees must meditate to progress towards enlightenment of “higher” life. Guru Nanak emphasized revelation through meditation, as its rigorous application permits communication between God and human beings. Transliteration: ikk ōankār sat(i)-nām(u) karatā purakh(u) nirabha’u niravair(u) akāl(a) mūrat(i) ajūnī saibhan gur(a) prasād(i). There is but one all pervading spirit, and truth is its name! It exists in all creation; it does not fear; it does not hate; it is timeless and universal and self-existent, You will come to know it through seeking knowledge and learning! In Sikhism, only lacto-vegetarian food is served in the Gurdwara (Sikh temple) but Sikhs are not bound to be meat-free. The consensus is that Sikhs are free to adopt a meat diet or not as they choose. Sikhs, once they become Amritdhari (initiated) via the Amrit Sanskar (initiation ceremony), are forbidden from eating Kutha or ritually-slaughtered (Halal, Kosher)meat because it transgresses one of the four restrictions in the Sikh Code of Conduct. According to the Akal Takht (Central Body for Sikh Temporal Affairs), Sikhs are allowed only to eat Jhatka meat (meat from animals that are slaughtered instantly by a single blow). Guru Nanak said it was pointless to debate the merits of either not eating or eating meat in the context of religion, as maintaining a strict diet does not make one blessed or elevate one to a superior status over another, spiritually or otherwise. Being a member of a religion incorporates not only one’s dietary customs, but the entire way in which devotees govern their lives. He advocated a life consisting of honest, hard work and humility, focus and remembrance of God, and compassion for all of humanity. These three key principles take precedence over one’s dietary habits. I tend to agree with one branch of Sikhism which argues that both plants and animals have life, and so it is not rational to separate the one from the other by arguing that eating meat involves taking life whereas eating plants does not. Just because a carrot does not scream when you harvest it does not mean that it is less of a living thing than a cow. Humans eat living things – and they eat us. Such is the nature of life. Nonetheless I’ll highlight a classic vegetarian Punjabi dish here, aloo gobi. It’s one of my favorites, and has taken me a long time to perfect. It’s a dry spicy dish made with potatoes and cauliflower. For a very thorough account of how to go about cooking it go here: http://www.vegrecipesofindia.com/aloo-gobi-recipe-punjabialoo-gobi/ It takes a lot of practice to get it right. The potatoes and cauliflower have to be cooked properly without boiling. The dish is very spicy, but dry, unlike the more usual heavily sauced curries you find in Indian restaurants that cover the waterfront from Goa, Kerala, Bengal, Madras, Gujarat, etc, but which can be highly generic. 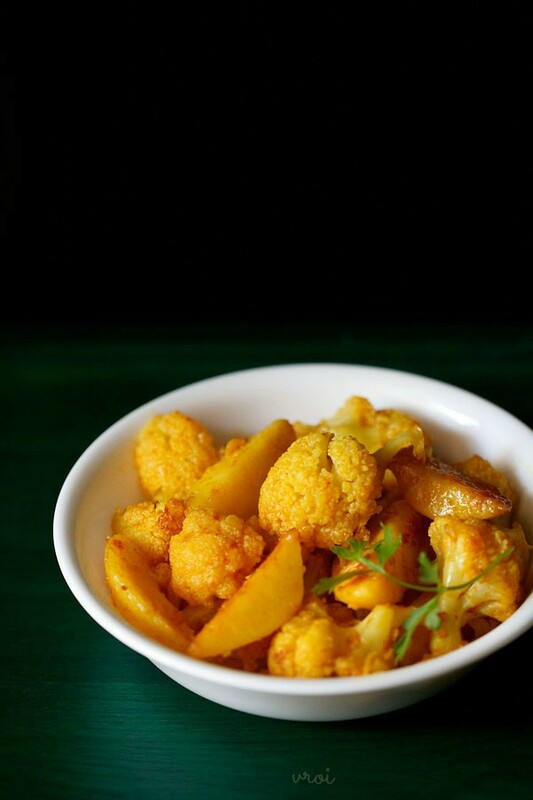 The principal seasoning of aloo gobi, added towards the end, is garam masala. I usually buy mine readymade, but it can vary considerably in content and quality. 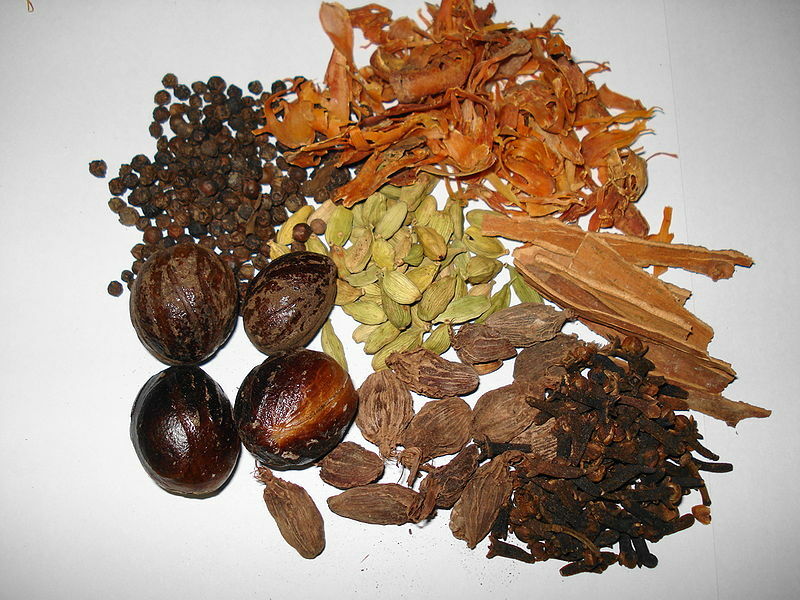 The basic ingredients are black peppercorns, mace, cinnamon, cloves, brown cardamom, nutmeg, and green cardamom. 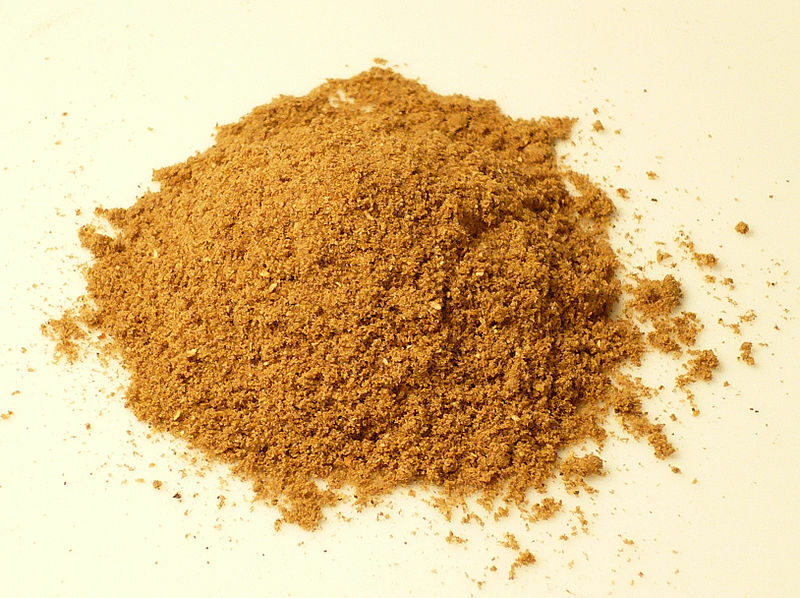 If you’re a real purist you can buy these spices whole and grind them together yourself. Ghee (clarified butter) is the preferred cooking oil, but plain vegetable oil is all right, and makes the dish vegan. You need a deep, heavy skillet with a tight fitting lid for a successful dish. Heat the oil over medium-low heat and add the potatoes and cauliflower. Sauté the vegetables for about 10 minutes, but do not let them take on color. Stir continuously while cooking. Add the ginger and turmeric and stir thoroughly to make sure that they are evenly distributed. 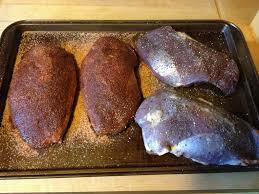 Cover tightly and reduce the heat to low. Cook undisturbed for about 20 minutes. The water in the vegetables will steam them. Uncover the pot, add the garam masala, turn the heat to medium high. You may need to add a little more oil at this stage if the pan is completely dry. Sauté for a few minutes to release all the flavors from the garam masala, stirring constantly to make sure the vegetables are evenly coated. Serve with plain boiled basmati rice, chutneys, pickles, and flat bread. On this date in 1660 Mary Dyer, born Marie Barrett, an English and colonial North American Puritan turned Quaker was hanged in Boston, Massachusetts Bay Colony, for repeatedly defying a Puritan law banning Quakers from the colony. 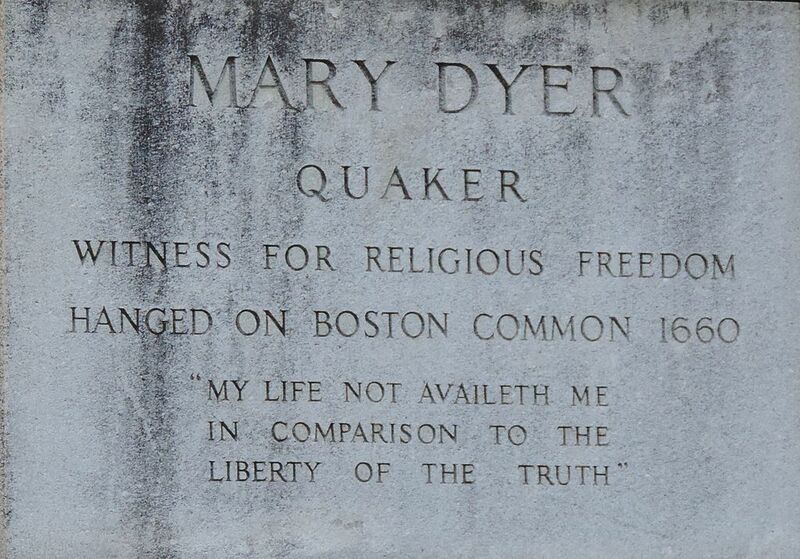 She is one of the four executed Quakers known as the Boston martyrs. While her place of birth is not known, she was married in London in 1633 to the milliner William Dyer. 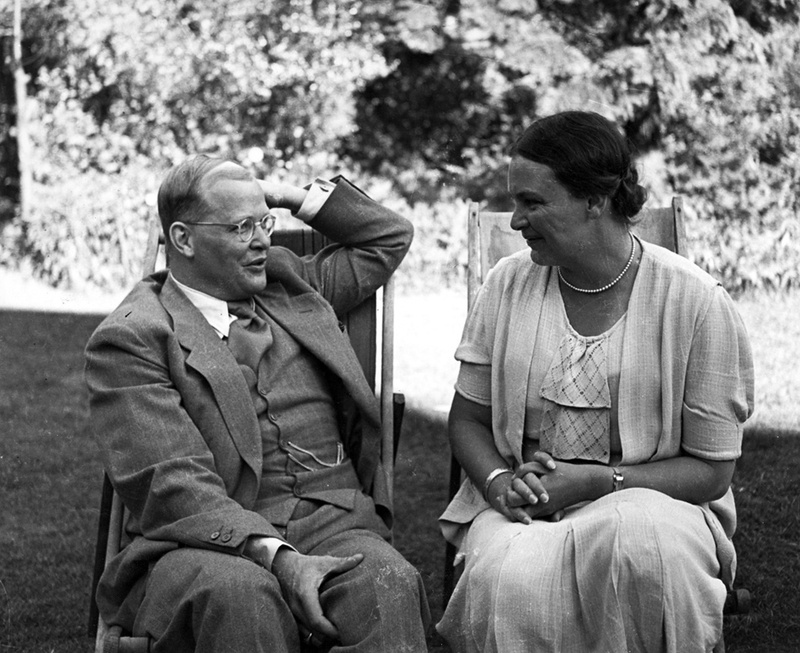 Mary and William were Puritans who were interested in reforming the Anglican Church from within, without separating from it. Because the English king, James VI & I, and parliament increased pressure on the Puritans, they left England by the thousands to go to New England in the early 1630s. Mary and William arrived in Boston by 1635, joining the Boston Church in December of that year. Like most members of Boston’s church, they soon became involved in the Antinomian Controversy, a theological crisis lasting from 1636 to 1638. Mary and William were strong advocates of Anne Hutchinson and John Wheelwright in the controversy, and as a result Mary’s husband was disenfranchised and disarmed for supporting these “heretics” and also for harboring his own heretical views. Subsequently, they left Massachusetts with many others to establish a new colony on Aquidneck Island (later Rhode Island) in Narraganset Bay. 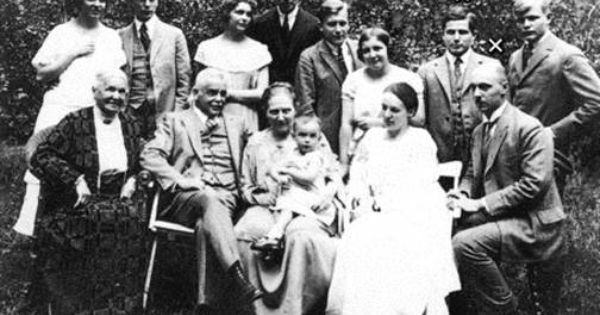 Before leaving Boston, Mary had given birth to a severely deformed infant that was stillborn. Because of the prevailing theological sentiments of the time concerning such a birth, the baby was buried secretly. When the Massachusetts authorities learned of this birth, its facts became public, and in the minds of the colony’s ministers and magistrates, the “monstrous” birth was clearly a result of Mary’s “monstrous” religious opinions. 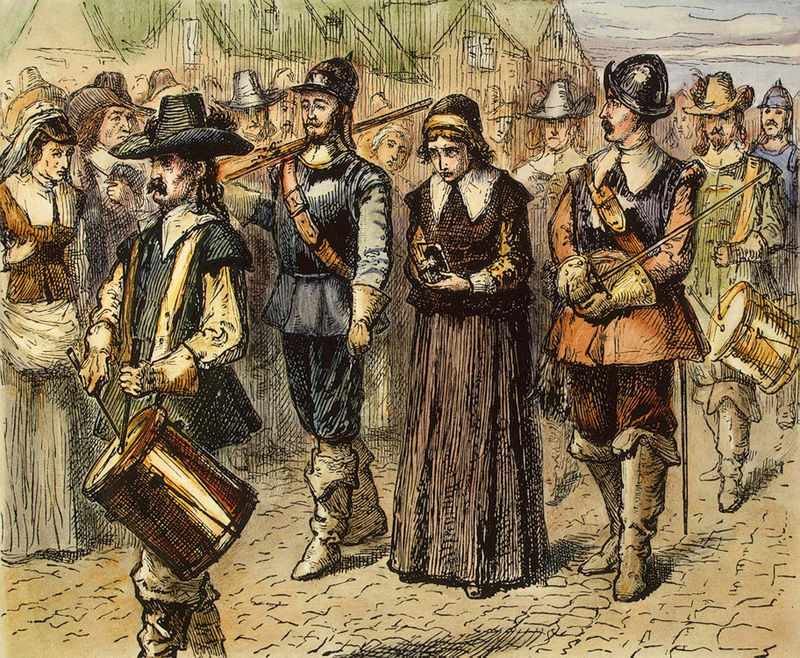 More than a decade later, in late 1651, Mary Dyer went by ship to England, and stayed there for over five years, becoming an avid follower of the Quaker faith that had been established by George Fox several years earlier. Because Quakers were considered among the most heinous of heretics by the Puritans, Massachusetts enacted several laws against them. 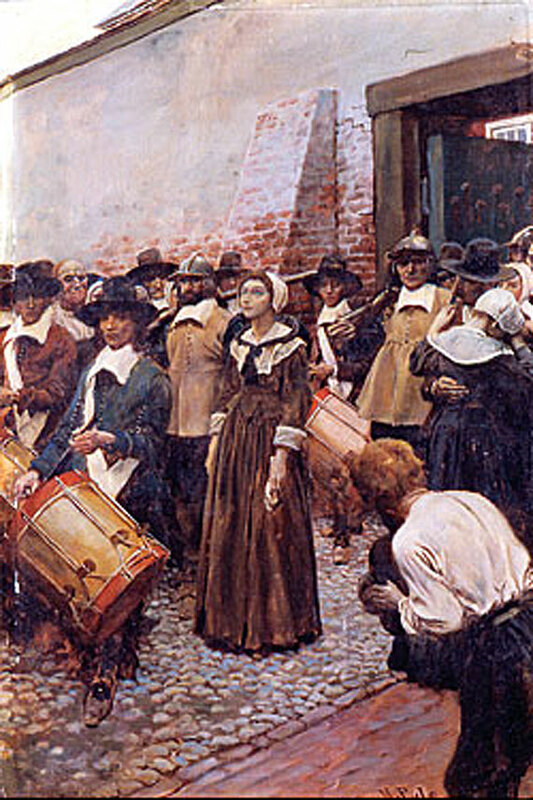 When Dyer returned to Boston from England, she was immediately imprisoned, and then banished. Defying her order of banishment, she was again banished, this time upon pain of death. 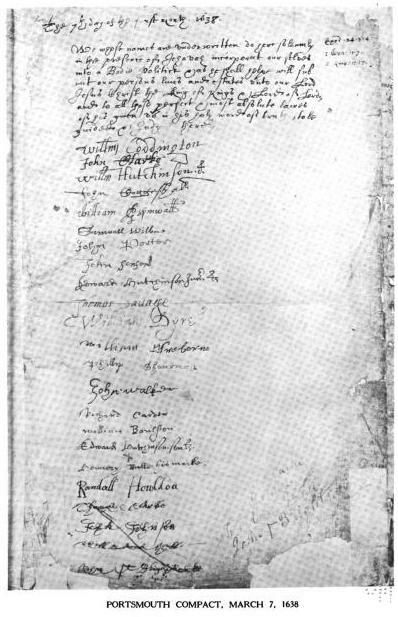 Deciding that she would die as a martyr if the anti-Quaker laws were not repealed, Dyer once again returned to Boston and was sent to the gallows in 1659, having the rope around her neck when a reprieve was announced. Not accepting the reprieve, she again returned to Boston the following year, and was then hanged to become the third of four Quaker martyrs. I’ll leave you to delve the details of Antinomian Controversy, free grace theology, and whatnot if you are interested. This happens to be an interest of mine, personally and professionally, but I don’t need to inflict a theological debate on you. What I will comment on, however, is the gross religious intolerance of the Massachusetts Colonial Puritans. It boggles the mind that Puritans who left England because they were not free to practice their religious beliefs, should turn around and be as intolerant of others as their former masters, whom they were fleeing, had been. But it makes sense, particularly in light of many current religious beliefs in the U.S.
What comes to mind for me are the speculations of the cultural geographer Wilbur Zelinsky who argues that the “first effective occupance” of a colony creates a permanent imprint for future generations. 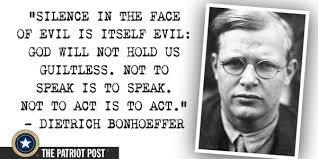 His arguments are a little too circular for my tastes, but I think there is a valid core to what he says. His thesis was put to me as a graduate student of folklore in this way: North Carolina was first settled by the English and so has an English feel to it nowadays, whereas Louisiana was first settled by the French and so has a French feel to it. The flaws in the argument are self evident. Louisiana was colonized by the Spanish before it was French. Why is there not more Spanish influence? Why is there not more Dutch influence in New York? Zelinsky focuses on the word “effective” here in circular manner. These attempts at colonization were not “effective” because they were swamped by later arrivals. In brief what he ends up saying is that the cultures of these “effective” colonists lasted, because they lasted !!! Enough said. My take on the whole debate is somewhat different. I see a certain strain of Puritanism and intolerance as everlasting in the United States, which is deeply ironic given the initial reasons that the Puritans fled England, and the underlying values of tolerance of the American Revolutionary and Independence movement. The fact is that the Puritans were not tolerant by nature. 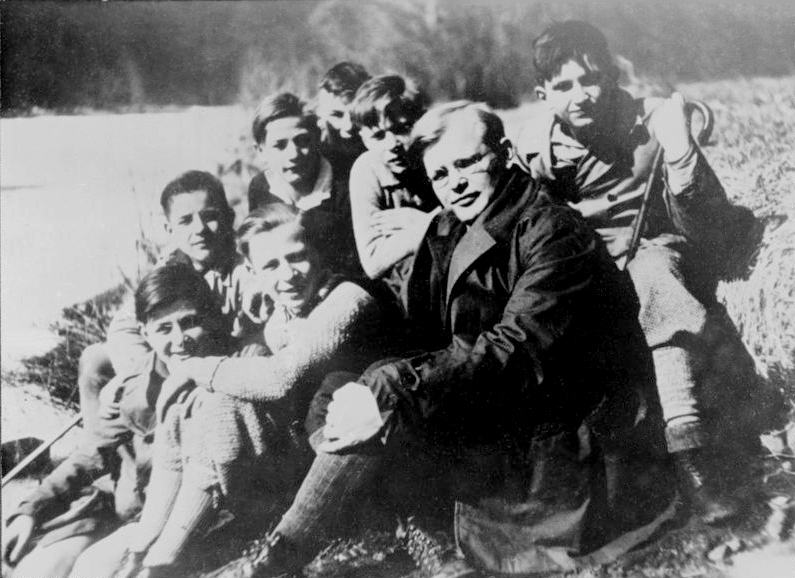 They were convinced of the rightness of their beliefs to the point that they wanted everyone to be like them. Oliver Cromwell is the poster boy of this stance. “I think plays and dancing will lead to Hell, so NO ONE may go to plays or dance.” Well, the English eventually told him what they thought of his ideas. Over time the English proved to be more tolerant than the people they expelled. The North American colonies were not founded on toleration, they were built as bastions of intolerance: places where individual sects could practice their own brands of belief but where dissent was not allowed. The Independence movement of the 18th century was not rooted in religious freedom but in economic and, hence, political realities. The French ideals of Liberty, Equality, Fraternity are all well and good, but it scarcely needs to be pointed out that these “ideals” were promoted in North America by slave holders who saw women as second-class citizens who could not hold property and could not vote. In order for the colonies to be united in opposition to England there had to be some compromises. The colonies valued their individual natures and their individual freedom from each other as much as they wanted freedom from England. Thus, federalism was born – a monster child if ever there was one. Under a federal system, states are free to pass laws on certain matters as long as they do not conflict with the overarching laws of the central government. How this works – or doesn’t – can be seen in the history of Supreme Court judgments; the Supreme Court exists to make sure that state law does not conflict with the (universal) Constitution. The American Revolutionary War could not have begun without the colonies first being united against a common enemy. This political reality, and not the founding principles of the original colonies, undergirds the idea of religious tolerance. The notion that there was to be no religious test for public office ensured that separate sects would not be disenfranchised nationally, not because one group valued the beliefs of others. They didn’t. For political purposes, the founding fathers enshrined religious tolerance in the Constitution. Back we come to Zelinsky. The founding ideas of Puritanism and intolerance still cling tight to segments of the population. Papering over the cracks in the federalist compromise won’t hide that fact. To this day there are segments of the population in the American South that believe that the Northern states had no right to abolish slavery in the Southern states, and that the Civil War was a gross miscarriage of justice. 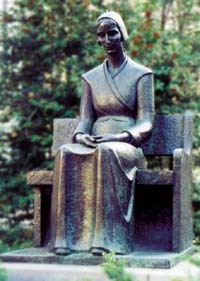 Mary Dyer was a deliberate martyr for the cause of religious freedom and individual rights, and her name is not well known enough. Her stillbirth was not her fault and she should not have been stigmatized for it. Neither should she have been imprisoned, sentenced to death, and banished from Massachusetts for her beliefs. The fact that she could have lived out her life in another colony was not good enough for her. 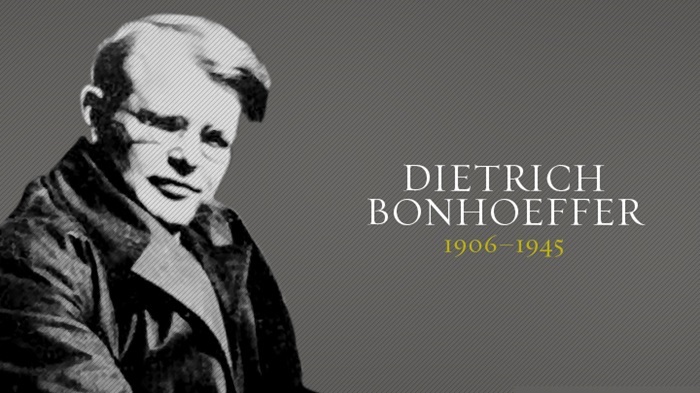 She kept defying laws and death sentences imposed on her by returning to Boston because she believed that these laws were unjust and hoped to change hardened hearts by her death – a true emulation of Christ (i.e. 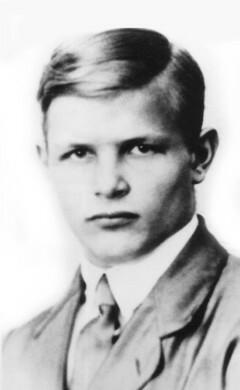 Christian). We do well to remember her on the anniversary of her death. 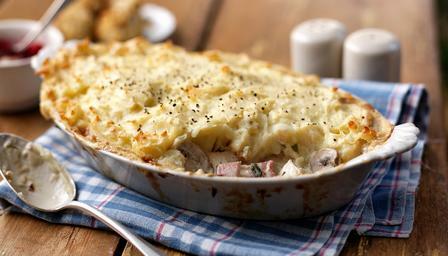 To make a Lamb Pye. First, Cut your Lamb into pieces, and then Season it with Nutmegs, Cloves, and Mace, and some Salt with Currans, Raisins of the Sun, and Sweet Butter; and if you will eat it hot, when it is baked put in some Yolks of Eggs, with Wine-Vinegar and Sugar beaten together; but if you will eat it cold, put in no Eggs, but only Vinegar and Sugar. You can fill out the instructions without too much trouble. It’s a typical 17th century mélange of meat and dried fruits with sweet spices. 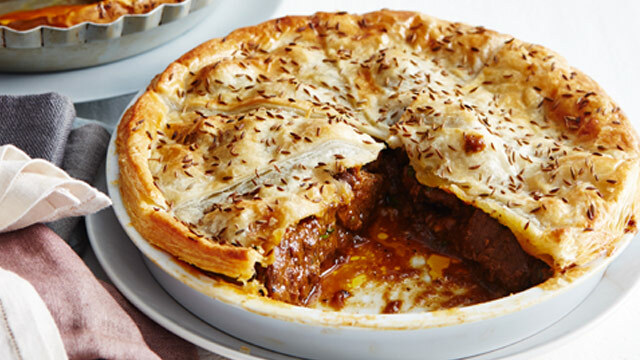 You’ll need a flaky pastry crust for the top. I’d be inclined to add some stock to the vinegar for additional flavor, but the fruit, sugar, and vinegar combination is a good sweet and sour mix. The egg yolks act to thicken the gravy. You can use flour instead if you wish, but eggs are richer. 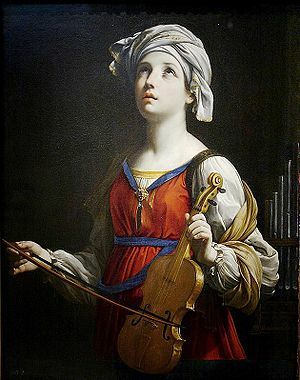 Today is the feast of Saint Cecilia. She is best known as the patron saint of musicians, but she is also patron of church music, poets, Albi in France, the Archdiocese of Omaha and Mar del Plata in Argentina (a favorite spot of mine and prime vacation destination for porteños). In addition there are many religious sites dedicated to her. Her patronage of musicians is based on the legend that when she sang on her wedding day it was if her heart were speaking to God. Her feast day is celebrated in the Roman Catholic, Anglican, Eastern Orthodox, and Eastern Catholic Churches on November 22. She is one of seven women, excluding Virgin Mary, commemorated by name in the Canon of the Mass. Cecilia is one of the most famous of the Roman martyrs, even though the familiar stories about her are undoubtedly not founded on verifiable historical material. The main “evidence” of the facts of her life comes from 5th and 6th century collections of tales of the saints which are clearly pious but of dubious credibility as regular readers of this blog will acknowledge. Cecilia perhaps lived in the 2nd and 3rd centuries (texts vary), fully 300 years before the stories about her were written. 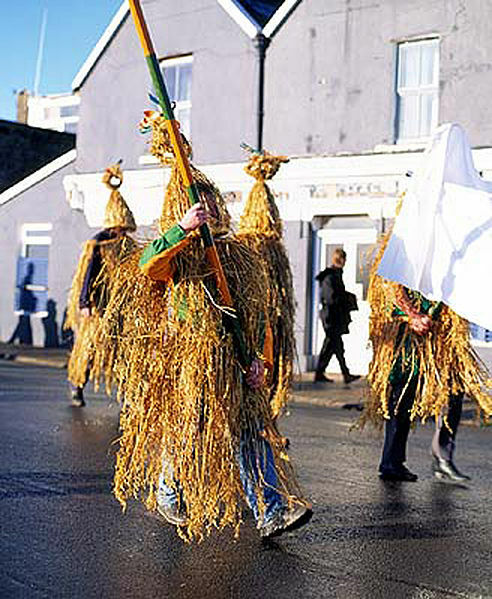 Furthermore there is no evidence that these texts were based on anything other than popular folklore. Her feast day has been celebrated since around the 4th century. It has long been supposed that she was a noble Roman woman who, with her husband Valerian, his brother Tiburtius, and a Roman soldier Maximus, suffered martyrdom in about 230, under the Emperor Alexander Severus. However, Venantius Fortunatus, Bishop of Poitiers (d. 600), says that she perished in Sicily under Emperor Marcus Aurelius between 176 and 180. This discrepancy alone should clue you in to the reliability of the material written about her. 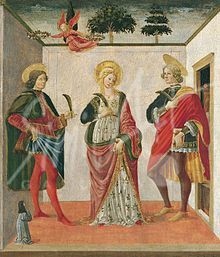 According to the popular story, when the time came for her marriage to be consummated, Cecilia told her new husband,Valerian, that she had an angel of the Lord watching over her who would punish him if he dared to violate her virginity but who would love him if he could respect her maidenhood. 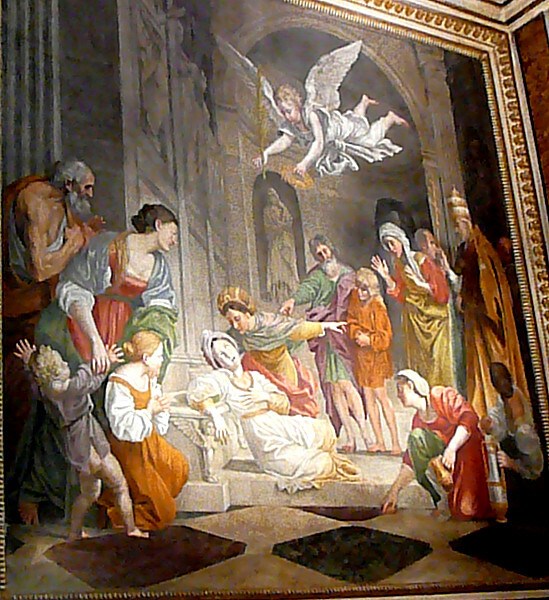 When Valerian asked to see the angel, Cecilia replied that he would see the angel if he would go to the third milestone on the Via Appia and be baptized there by Pope Urbanus. There is no mention of Cecilia in the Depositio Martyrum, but there is a record of an early Roman Christian church founded by a woman of this name. 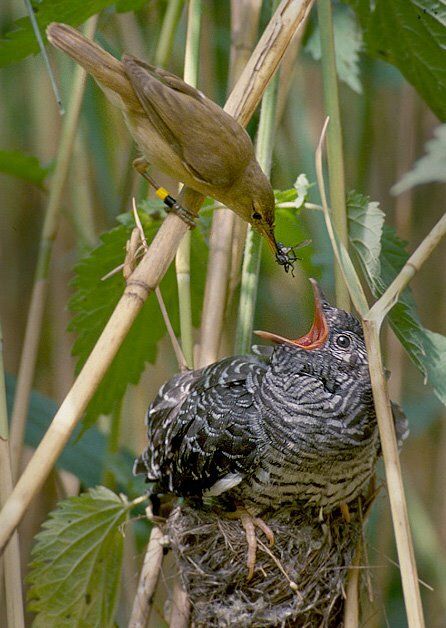 However, the name “Cecilia” was shared by all women of the Roman gens (clan sharing a common ancestor) known as the Caecilii, whose name may be related to the root of ‘caecus,’ blind. Hence, the church could have been founded by any of hundreds of women from the gens. It was a family name, not a given name. Legends and hagiographies, mistaking it for a personal name, suggest fanciful etymologies. Among those cited by Chaucer in “The Second Nun’s Tale” are: lily of heaven; the way for the blind; and contemplation of heaven and the active life. 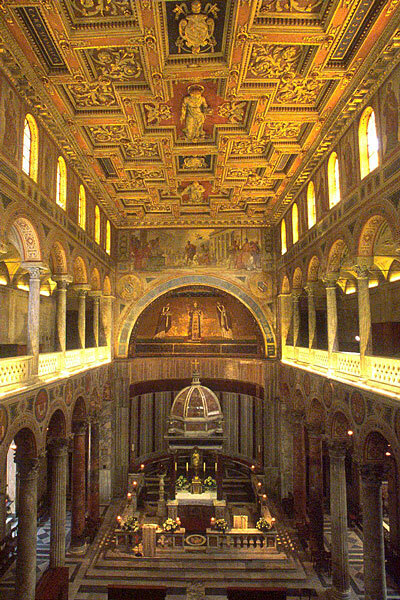 The Church of St. Cecilia in Trastevere is reputedly built on the site of the house in which she lived. The original church was constructed in the fourth century; her remains were placed there in the ninth century and the church was rebuilt in 1599, at which time her tomb was opened and her body was reported to be incorrupt (a common claim for saints but this is the earliest). 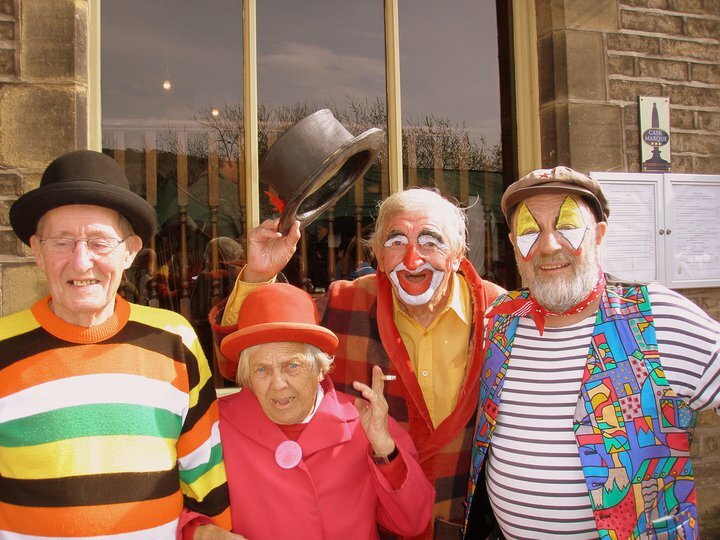 The first record of a music festival in her honor was held at Évreux in Normandy in 1570. 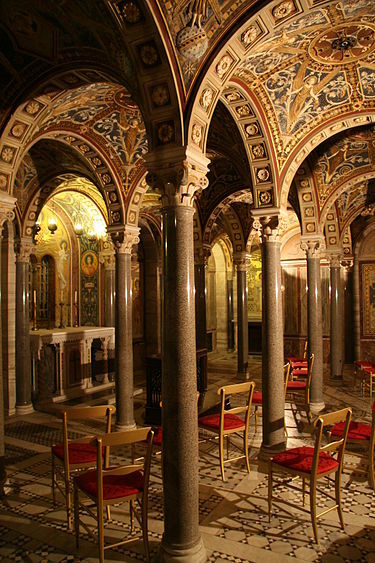 The National Academy of Santa Cecilia is one of the oldest musical institutions in the world. 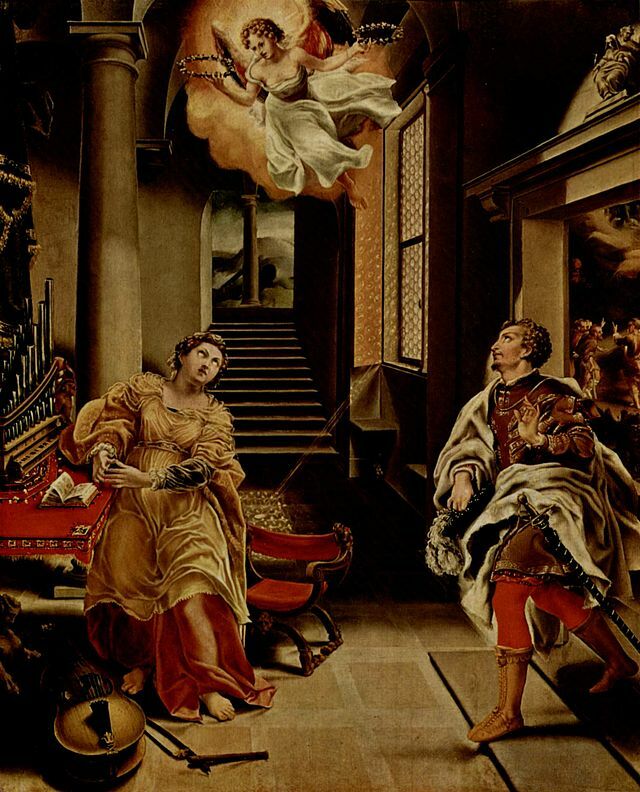 It was founded by the papal bull, Ratione congruit, issued by Sixtus V in 1585, which invoked two saints prominent in Western musical history: Gregory the Great, for whom the Gregorian chant is named, and Saint Cecilia. Her feast day became a regular date for musical concerts and literary festivals that occasioned well-known poems by John Dryden (“A Song for St Cecilia’s Day”) and Alexander Pope (“Ode on St Cecilia’s Day”), and music by Henry Purcell (Ode to St. Cecilia), several oratorios by Marc-Antoine Charpentier (In honorem Caeciliae, Valeriani et Tiburtij canticum, and several versions of Caecilia virgo et martyr, to libretti probably written by Philippe Goibaut), George Frideric Handel (Ode for St. Cecilia’s Day, Alexander’s Feast), Charles Gounod (Messe Solennelle de Sainte Cecile), as well as Benjamin Britten, (who was born on her feast day). 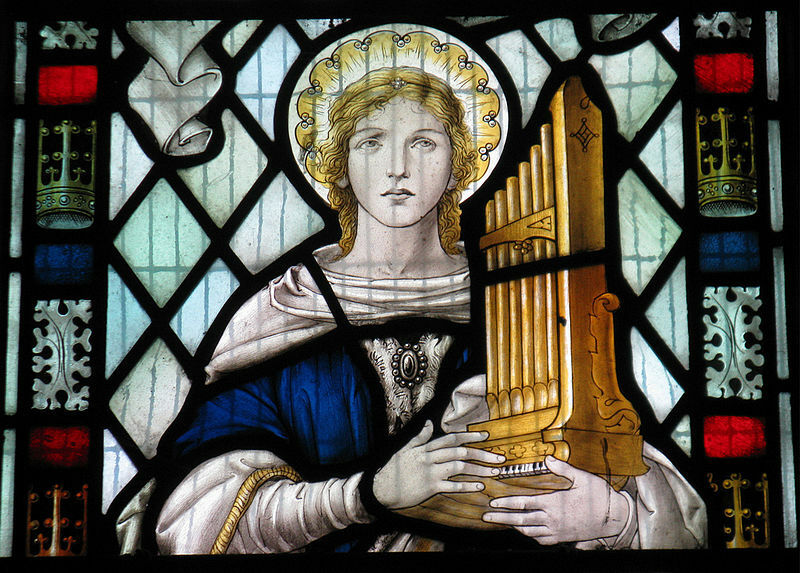 Herbert Howells’ “A Hymn to Saint Cecilia” has words by Ursula Vaughan Williams, Gerald Finzi’s “For Saint Cecilia,” Op. 30, was set to verses written by Edmund Blunden, Michael Hurd’s 1966 composition “A Hymn to Saint Cecilia” sets John Dryden’s poem, and Frederik Magle’s “Cantata to Saint Cecilia” is based on the history of Cecilia. Most, if not all, of these pieces can be found on YouTube if you are interested. Here’s the Purcell and Handel (only so much time I can spend searching on the web for a daily blog !!). Purcell’s “Hail! 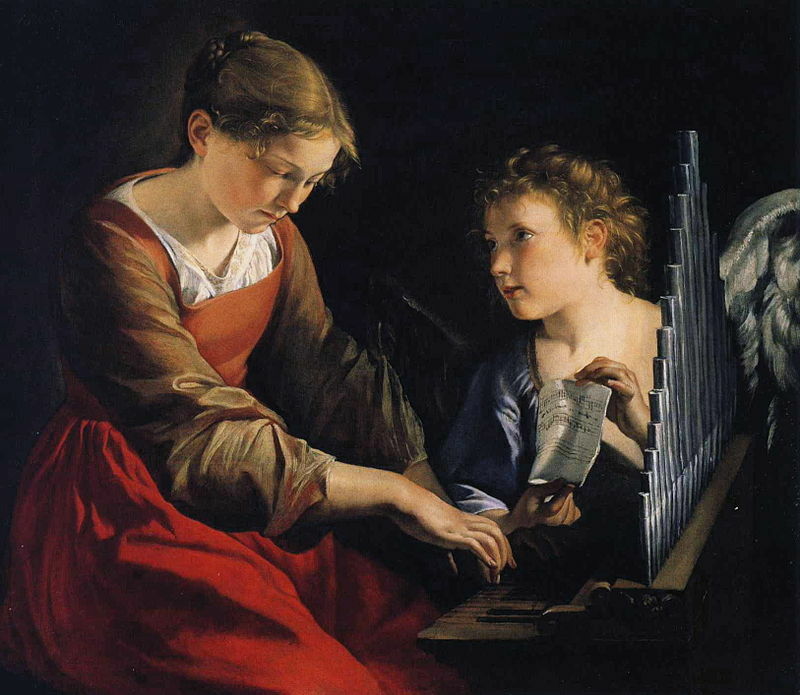 Bright Cecilia” (Z.328), also known as “Ode to St. Cecilia,” is a setting of a text by Nicholas Brady composed in 1692. It was first performed at the annual St Cecilia’s Day concert sponsored by the Musical Society of London. Purcell had already written Cecilian pieces in previous years, but this Ode remains the best known. The first performance was a great success, and received an encore. 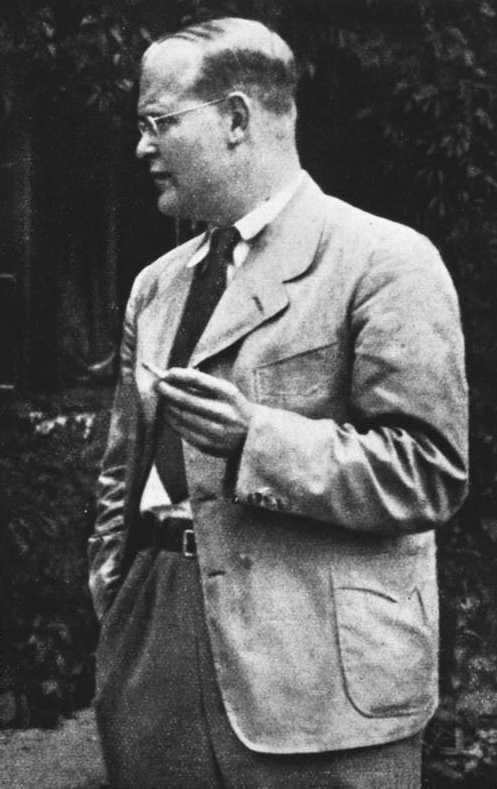 Brady’s poem is full of references to musical instruments, and Purcell’s work requires a wide variety of vocal soloists and obbligato instruments. Brady extols the birth and personality of musical instruments and voices, and Purcell treats these personalities as if they were dramatic characters. The airs employ a variety of dance forms. For example, “Hark, each Tree” is a sarabande on a ground. It is a duet on a ground-bass between, vocally, soprano and bass, and instrumentally, between recorders and violins (“box and fir” are the woods used in the making of these instruments). 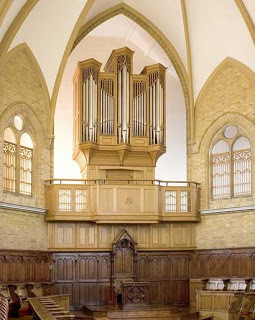 “With That Sublime Celestial Lay” and “Wond’rous Machine” are in praise of the organ. “Thou tun’st this World” is set as a minuet. “In vain the am’rous Flute” is set to a passacaglia bass. In spite of Brady’s conception of the speaking forest (English organs of the period typically had wooden pipes), Purcell scored the warlike music for two brass trumpets and copper kettle drums instead of fife and (field) drum. The Handel piece (HWV 76) is a cantata that is a setting of the poem by Dryden. The main theme of the text is the Pythagorean theory of harmonia mundi, that music was a central force in the Earth’s creation. The premiere was on 22 November 1739 at the Theatre in Lincoln’s Inn Fields, London. Much of the instrumentation and use of percussion are exemplars of 18th century style, in great part initiated by Handel. Among other things, Cecilia has become a symbol of the conviction that good music is an integral part of liturgy. She is frequently depicted playing a viola, a small organ, or other musical instrument. Other images focus on her martyrdom and subsequent crowning, with Valerian, in heaven. The Sisters of Saint Cecilia are a group of consecrated religious sisters. They are the ones who shear the lambs’ wool used to make the pallia of new metropolitan archbishops. The lambs are raised by the Cistercian Trappist Fathers of the Tre Fontane (Three Fountains) Abbey in Rome. 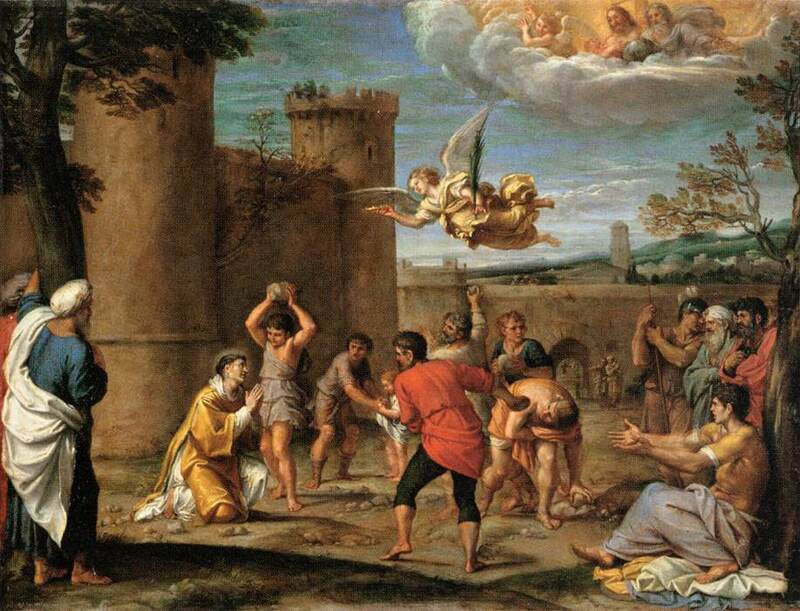 The lambs are blessed by the Pope every January 21, the Feast of the martyr Saint Agnes. The pallia are given by the Pope to the new metropolitan archbishops on the Solemnity of Saints Peter and Paul, June 29. St Cecilia’s Abbey, on the Isle of Wight, was founded in 1882. The nuns live a traditional monastic life of prayer, work and study in accordance with the ancient Rule of St Benedict. 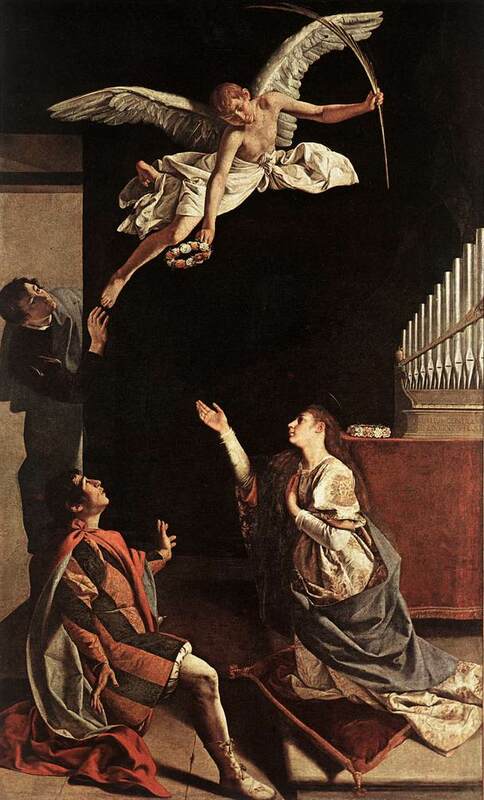 Food is not generally associated with St Cecilia given that her feast is celebrated primarily with music. I was able to dig up a couple of related recipes, however. There is a little known dessert sauce called St Cecilia Sauce which seems to me rather uninteresting. It is basically egg yolks beaten with powdered sugar, and then folded into whipped cream to which has been added some flavoring such as vanilla or sherry. Yawn. There is also a drink known as St Cecilia Society Punch created for the exclusive St Cecilia Society of Charleston, SC, founded in the 18th century as an exclusive club of rich patrons of music. The society still exists, but no longer supports music. As longtime readers know, I very rarely include recipes for drinks. I don’t really think of them as recipes as such. But this one clears the bar, barely. Put the lemon slices in a large bowl and pour the brandy over them. Let macerate at room temperature overnight. In a small saucepan, make a simple syrup by combining the sugar with ¾ cup water and bringing to a boil over high heat. Cook, stirring occasionally, until the sugar dissolves. Remove from the heat, add the tea bags, and steep for 2 to 3 minutes. Discard the tea bags and let the syrup cool. 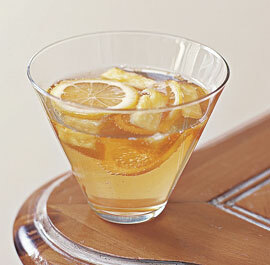 Combine the macerated lemons, brandy, syrup, rum, and pineapple in a large punch bowl. Chill in the refrigerator for a minimum of 3 hours, preferably longer. Just before serving add a block of ice to the bowl. Add the sparkling wine and sparkling water, and gently stir. 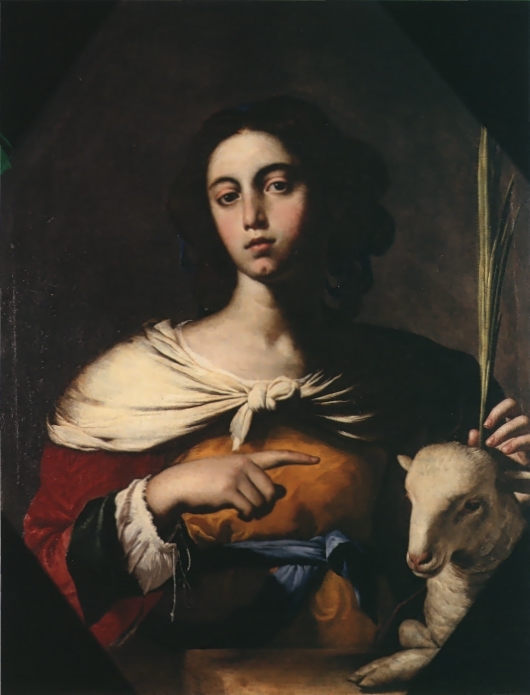 According to tradition, Saint Agnes was a member of the Roman nobility born c. 291 and raised in a Christian family. She suffered martyrdom at the age of twelve or thirteen during the reign of the Roman Emperor Diocletian, on 21 January 304. 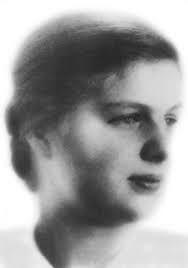 As with all early saints there are a great many fabulous stories surrounding her martyrdom, but the nugget that lies at the heart appears to be that being from a noble family, she was courted by a great many men who were not Christians. She refused them all and so she was reported to the emperor as a Christian. Diocletian held one of the most brutal series of purges of Christians during imperial times, so this seems entirely plausible. An early account of Agnes’ death, stressing her steadfastness and virginity, but not the legendary features of the tradition, is given by Saint Ambrose. Her bones are said to be interred under the altar of Sant’Agnese fuori le mura, a basilica built over ancient catacombs in Rome (which can still be visited). In popular tradition the feast of St Agnes is a lot less important than the eve of the feast (i.e. Jan 20th), which is a day/night of prognostication for unmarried women to perform certain rituals which, if done correctly, allow the women to dream of their future husbands. 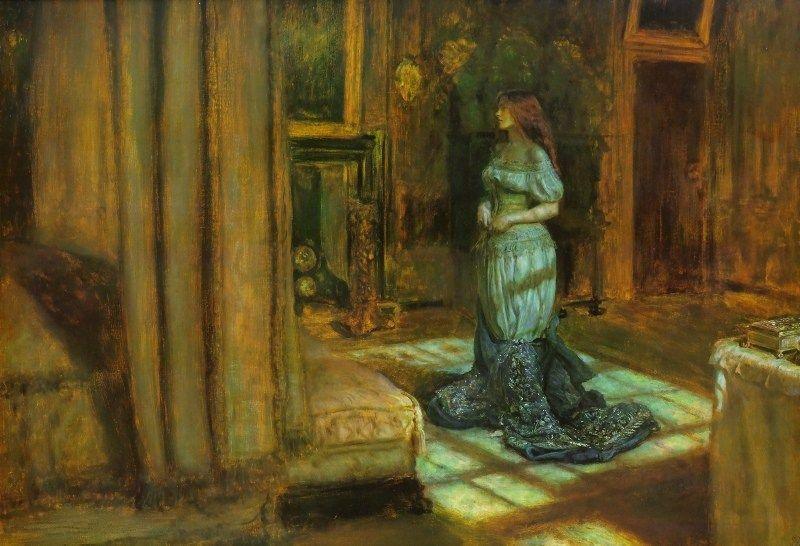 In one version, a girl could see her future husband in a dream if on the eve of St. Agnes she would go to bed without any supper, undress herself so that she was completely naked and lie on her bed with her hands under the pillow and looking up to the heavens and not to look behind. Then the proposed husband would appear in her dream, kiss her, and feast with her. 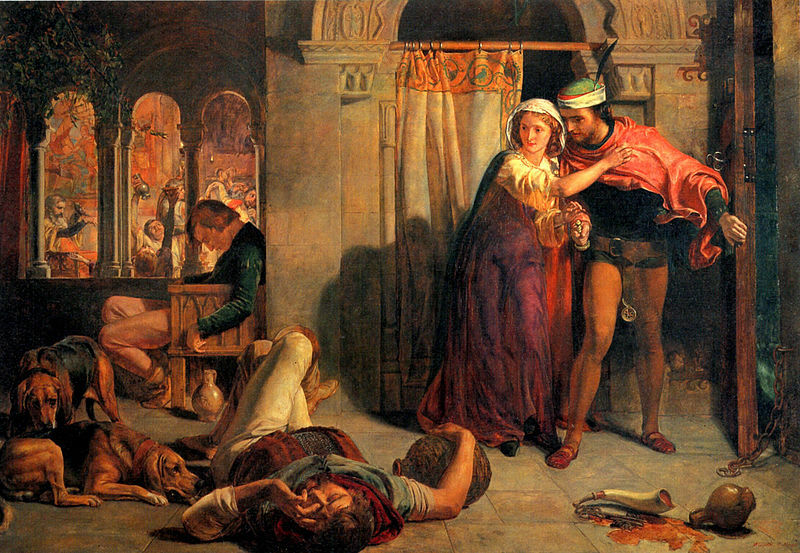 John Keats used these traditions as the basis for his poem, “The Eve of St. Agnes,” a long poem that is rather reminiscent of Romeo and Juliet, although with a less tragic end. Madeline, the heroine, is the member of a warlike family, sworn enemy to the family of Porphyro, the man she loves. On the eve of St Agnes Madeline’s kin become involved in a long drinking session while Madeline pines for the love of Porphyro. The old women of the household have told her she may receive sweet dreams of love from him if on this night, St. Agnes’ Eve, she retires to bed under the proper ritual of silence and receptiveness. Porphyro makes his way to the castle and braves entry, seeking out Angela, an elderly woman friendly to his family, and persuades her to lead him to Madeline’s room at night where he may gaze upon her sleeping form. Angela is persuaded only with difficulty, saying she fears damnation if Porphyro does not afterward marry the girl. Concealed in an ornately carved closet in Madeline’s room, Porphyro watches as Madeline makes ready for bed, and then, beholding her full beauty in the moonlight, creeps forth to prepare for her a feast of rare delicacies. Madeline wakes and sees before her the same image she has seen in her dream, and thinking Porphyro part of it, receives him into her bed. Awakening in full and realizing her mistake, she tells Porphyro she cannot hate him for his deception since her heart is so much in his. Porphyro declares his love for Madeline and promises her a home with him over the southern moors. They escape the castle past drunken revelers, and flee into the night.